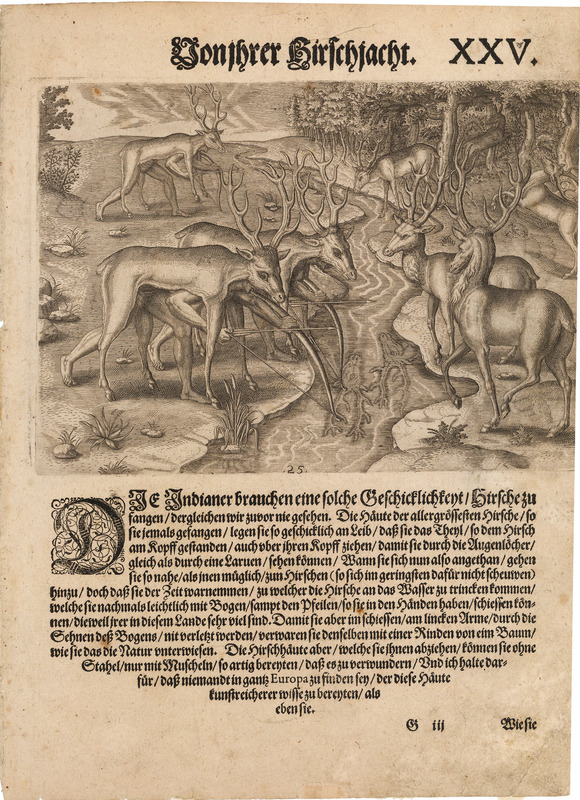 This engraving depicts indigenous peoples of North America as they hunt stags, and was published originally by Theodor de Bry, and then later by Gottfried. Jacques le Moyne de Morgues was the official artist on two French voyages to Florida in the 1560s, and he documented the Timucuan Indians of the region as well as the construction and later destruction of the French settlement at Fort Caroline. His account is less well known for its text than for the forty four engravings produced by Theodor de Bry in multiple volumes dedicated to European exploration of the New World. Condition: This engraving is in B+ condition, with the right edge shorn to the border of the image.